Member for Gippsland Darren Chester (Nationals) has made a clumsy entry into the wind energy debate by claiming wind turbines are a fire risk. So, what is known about wind turbines and fire? There have been three fires in wind turbines in Australia that I know of: Lake Bonney, Jan. 2006; Cathedral Rocks, Feb. 2009 and Starfish Hill, Oct. 2010; all of them were in SA. The first was due to an electrical fault during maintenance work. I do not know the cause of the Starfish Hill fire; the other happened during ‘normal’ operation. While I believe there were spot fires around the Cathedral Rocks turbine, none of these caused a bushfire, but the possibility is there. 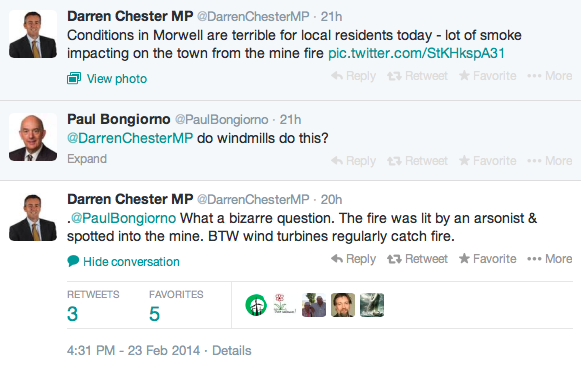 Contrary to Darren Chester’s insinuation, the presence of wind turbines in the landscape may actually reduce fire risk. As the structures are fitted out with lightning protection devices they allow nature’s electrical currents a safe path to the ground. Lightning striking a turbine tower is much safer than striking a bone-dry field or tree, both of which may ignite. According to the Victorian Government, lightning strike is responsible for 26 percent of wildfires and 46 percent of the area burned. 25 percent of bush fires are deliberately lit. Other causes of fire are burning off, campfires, matches and cigarettes, machinery, and escaped back burning. 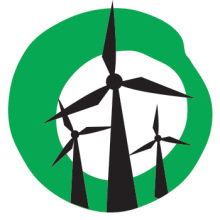 Wind farms are not listed among the sources of ignition. Chester’s comments are typical of the ill informed anti-renewable verbiage received from fossil fuel apologists. I’m only surprised that it has taken so long for him to declare his hand so openly. He must have fossil fuel connections. He must be in denial. AH if he questions anything about wind farms he is anti- renewables . Normal rubbish. The end is coming Blair. And I don’t mean end of the world either. Parliament should have a fibbing box. Every outright lie and they cough up for a worthy cause like, I don’t know, how about the greatest moral and responcivness challenge of our time? Right wing politicians open their mouths and words fall out. Then, when called, they do one of three things: some dig deeper; some claim that’s not what they said or it was taken out of context; some disappear for as long as possible. Wonder which one Darren Chester will do.